Komed Health is providing a secure and powerful real-time communication platform, purpose-build for hospitals in order to dramatically facilitate communication and collaboration in care teams. Komed Health can be integrated into existing infrastructure enabling integrated care pathways. Using the Komed Health platform makes healthcare providers drastically more productive, increases their patient satisfaction substantially and allows them to use their infrastructure efficiently. 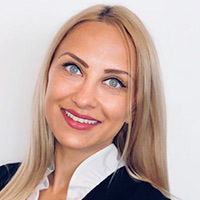 Luiza Dobre is dedicated to transform communication to help doctors, nurses and other healthcare workers to deliver the best in class patient care – and actually save lives. Luiza’s passion lies in using technology as an enabler to drive a positive impact in Healthcare. Luiza has about 10 years experience in leading and developing business.